We take a look at the circular fisheye lens from Sigma - the world’s only 8mm lens with full autofocus capability. This circular fisheye lens from Sigma is the world’s only 8mm lens with full autofocus capability. With some speciality uses as well as the novelty images it can produce, we take a look at it’s capabilities. 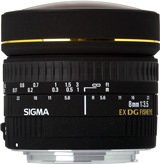 Being a member of Sigma’s EX family, this lens is well built and finished and is supplied in it’s own zip-topped semi-hard pouch. The only controls on the lens are the manual focus ring with a distance scale marked in metres and feet and the standard AF/MF switch. There is a depth-of-field scale marked on the lens that has an exceptionally large range due to the focal length of the lens. There is no filter thread, or, for that matter, a hood bayonet as the coverage of the lens, being a full 180°, stops any accoutrements forward of the front element being permissible. The lens cap/hood is a two part affair consisting of a stopped sleeve and a fairly normal lens cap that fits onto it. The sleeve sports a 72mm filter thread and cap. 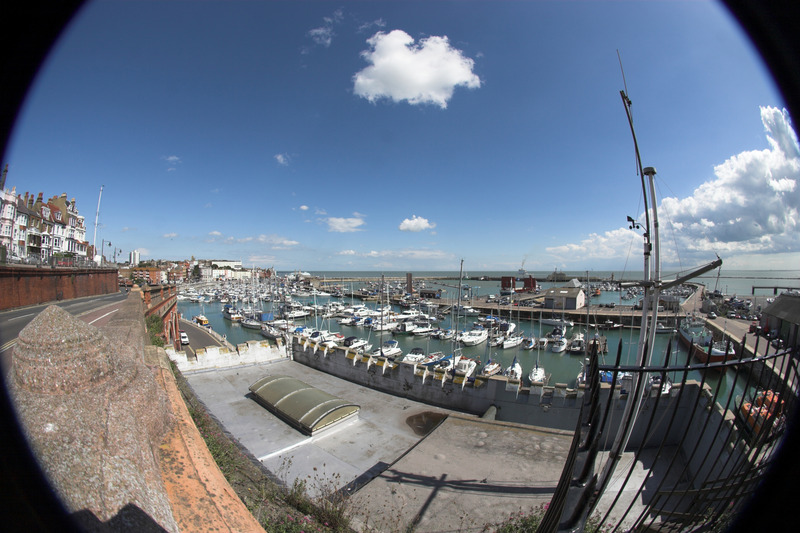 And 72mm filters can be used in this thread, albeit at the expensed of further vignetting. Under manual focussing, the ring requires a quarter turn to go through the full range and the ring does turn during autofocus, which is fairly quiet during operation and quick enough for any purpose this lens could be put to. A spring loaded holder is fitted to the rear element of the lens to accept gelatine filters and the lens comes with a metal template to assist in the cutting of these from gelatine sheet. The lens is not the kind of thing you would want to carry on the camera all day, but it is light enough and compact enough to fit in the camera bag with hardly any penalty. An unusual lens to test as the program we use is designed to measure resolution on a slant edged straight line. In the centre we obtained a line straight enough to measure, but, due to the nature of the lens, a line straight enough to put through the system proved impossible. Distortion, similarly, is not measurable by our normal methods but suffice to say that, on a full frame camera, it is circular, just like it says on the box! The resolution readings obtained from the centre of the frame are outstanding with the lens wide open and a peak is very soon reached at f/4 and staying high until f/11 where reciprocity starts to play its part. Contrast is very good, with the 10-90% rise staying well below one pixel throughout. Chromatic aberrations are also exceptionally well controlled with no readings even approaching a level of concern. Flare, although present to an extent when strong light sources were included in the frame (fairly un-avoidable considering the type of lens) is restricted to the area of the image it is included in and no ghosting is apparent showing strong control of internal reflections. 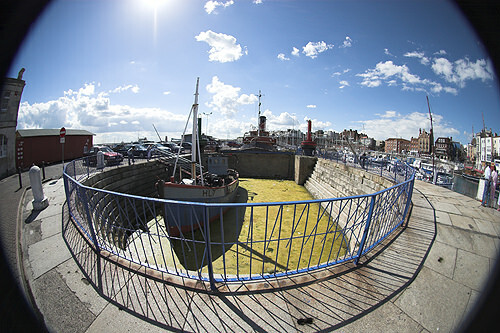 The full effect of a circular fisheye is not visible on a cropped sensor but these shots give a good idea of the type of image you can obtain. Taken at f/8 on a Canon EOS 20D. Again on a Canon EOS 20D, this shot gives an idea of the amount of distortion exhibited towards the edges. 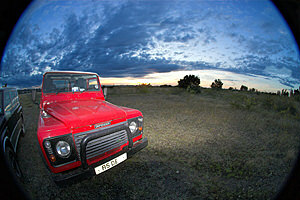 The lighting clearly shows the coverage of the EOS 20D’s on board flash, used here to attempt some fill-in. For those needing this type of lens, for example when using software to create panoramics or for those involved in the scientific measurement of angles, where the output from this lens is quantifiable, this lens is an excellent tool. For those who just want to experiment with the unusual perspective of a 180° field of view, or even the somewhat reduced field if using the lens on a cropped sensor, then this lens is a high class example.